It was evening 6:00 pm and I was looking for autos in K.R. Market area. Since it was office-off time, none of the autos were free and also the buses were all jam packed. I started walking towards K.G. road, thinking that I may find an auto on my way. But I couldn't! I got one auto and he asked me 150 Rs., more than double the meter rate and I refused hire him after gently asking him to go by meter. After walking around 4km., I saw a vacant auto in a traffic signal. At that time I was near Majestic Bus Stand. From Majestic, roughly 55 Rs. fare is normal. I said near 18th cross. He asked for Rs. 90. without meter. I smiled since I had no option and it was getting late. I told him Rs. 60 is the max I could offer. He came down to Rs. 75. "18th cross, Temple Maramma tak jana hai", I said and sat inside. (18th cross, Maramma Temple is where I want to go.) That is where our campus' entrance gate is located. And then came the funny part. Then after a momentary pause I said, "Kya bhaiya, aap sandhya ke samay zada paisay maangtey, pata hai uper se bhagwan cross hotey iss samay!" (You are asking for extra money at the time of dusk. You know God travel around during that time.) During my childhood, my grandmother used to give me this reason to wake me up if I was asleep in evening. He took 60 Rs. from me and left. I smiled an moved on! 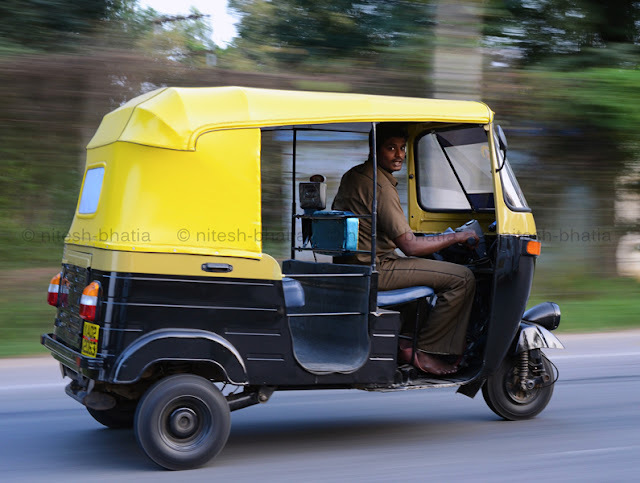 PS: The auto-driver in photograph is not the same one as in the post. I took that photo long time back when I was learning panning-photography.